Zaccaria Cicconetti first appears in the Painesville, Ohio, area between 1913 and 1917. Zaccaria Cicconetti was born on February 15, 1889, at Campli, Italy. He immigrated to the United States on August 8, 1913, at age 24, travelling to Monaco, Pennsylvania. He was joining a friend, Franco Romani. Zaccaria registered for the military draft for World War One on June 5, 1917, living at Plum Street, Fairport Harbor, Lake County, Ohio. He was employed by the Diamond Alkali Company. 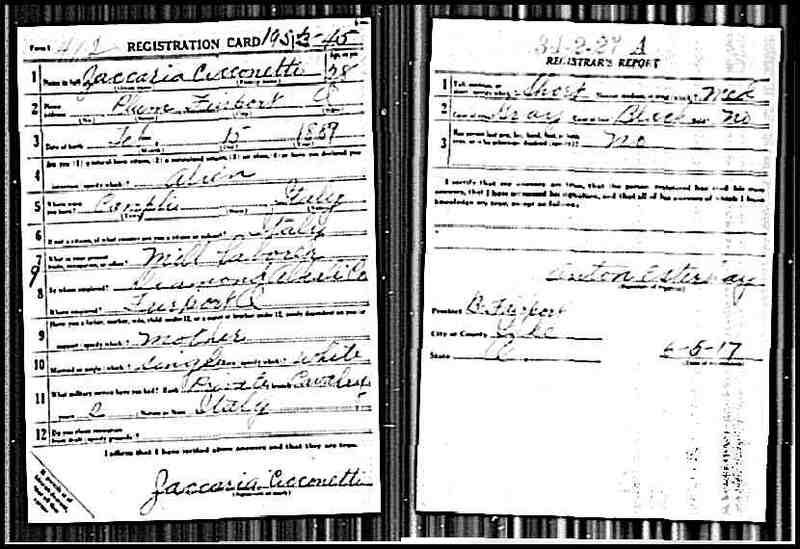 Zaccaria Cicconetti was enumerated for the 1920 Census of the United States, on January 09, 1920, living at 300 Richmond Street, Painesville City, Lake County, Ohio. He was a lodger of Nazareno Valocchi. Zaccaria Cicconetti may have been related to Painesville Italian Antonio Cicconetti.